The Youth Guarantee says that it will guarantee “young people a quality offer of employment, education, an apprenticeship or a traineeship, within four months on becoming unemployed or leaving full-time education.” So far so good, but does it do what it says on the tin? Unfortunately, the answer is a resounding no. The only thing which is copperfastened by it is compulsory free labour. The idea of a Youth Guarantee has been used in other European countries before. In those countries, and likely to happen in Ireland, is a major disappointment. Rather than guaranteeing you work in an industry you are interested in, young people are packed into whatever industry will have them. The disappointment in the scheme was so great in Denmark that they actually dropped the word guarantee from their programme. The Youth Guarantee is being implemented on the cheap. Across the EU the ILO estimated a proper Youth Guarantee would cost €21 billion, only €6 billion has been allocated, in Ireland it is estimated to cost at least €276 million yet only €46 million will be spent. The only thing that the Youth Guarantee makes ample provision for is forced free labour. 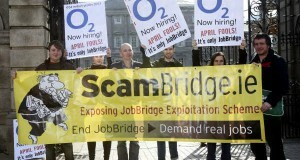 For the first time, JobBridge, the discredited internship scheme, is being made compulsory. Anyone who refuses to take part in it will face having their dole cut from €100 to €75. This will turn a generation of young people into a pool of free labour for exploitative companies, like Advance PitStop, to take advantage of or drive them into poverty.. The choices are stark – free labour, starve or emigrate. These measures are part of a massive attack on the unemployed, and the cementing of forced labour schemes as the cornerstone of government policy to massage the unemployment figures, lower wages and conditions and drive people off the dole. On top of making JobBridge compulsory, the government are stepping up the roll out of the Gateway scheme – this will see 3,000 long-term unemployed people put to work for 19.5 hours a week for 22 months for local councils for the princely sum of €20 on their dole. The work will be in areas like roads and parks, along with positions as “tourist ambassadors” which will require constant smiling. These schemes are accompanied by propaganda to paint the unemployed as lazy and to shift the blame for unemployment from the system to te person themselves. If you are young and can’t get a job its because you have no experience therefore need to do a JobBridge. Gateway is about “giving people a reason to get out of bed” therefore the logical conclusion is that if you refuse to be exploited you are lazy and don’t want to work. Mass unemployment is not an individual’s fault, it is the fault of capitalism which cannot provide a decent standard of living for people because the wealth of society is in the hands of a small elite. Instead, the resources of society must be taken into the hands of the working class. Through democratic workers control of the economy, which would be the basis for a new form of state, this wealth could be used to create jobs and raise living standards of people through socially useful and beneficial investment.